BEIJING, China (CNN) -- The head of major Chinese dairy firm Sanlu Group has argued that the country's lack of regulations regarding a toxic chemical contributed to a tainted milk scandal that sickened nearly 300,000 infants, state-run media reported. 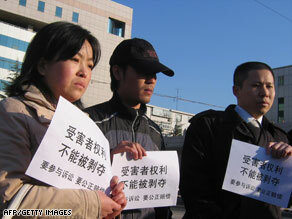 Victims' relatives outside a court hold banners that read "cannot deprive the victims' rights." In a statement distributed by her attorney on Thursday, Tian said China should consider the standards of the European Union regarding the chemical melamine. She also said other independent companies under the Sanlu umbrella produced some of the "tainted milk powder" and their leaders should also shoulder some responsibility. "If it meant that I could get back the health of all the sick children, I would be willing to accept any legal punishment," she said. The three other executives on trial are former deputy general managers Wang Yuliang and Hang Zhiqi, and Wu Jusheng, a former executive heading Sanlu's milk division. Wang has appeared in court in a wheelchair after he broke his leg in a suicide attempt leaping from a building. A defense attorney asked him about the attempt, and Wang broke down into tears, according to Xinhua. "I apologize to Sanlu's faithful consumers," he said. "When I think of the children who were harmed ... I feel extreme inadequacy towards these sick children and their parents." The trial ended after a 14-hour session. It was not clear when a verdict was expected. The tainted formula came to light in September after babies who were fed milk powder produced by Sanlu Group, which recently filed for bankruptcy, had developed kidney stones. Prior to the four Sanlu executives, at least eight people stood trial over charges of adding melamine-laced "protein powder" to milk or selling the tainted milk to Sanlu or other dairies. Victims of tainted baby formula were expected to be compensated by the 22 Chinese dairy producers that made the milk.